Be the first to share your favorite memory, photo or story of Jay . This memorial page is dedicated for family, friends and future generations to celebrate the life of their loved one. 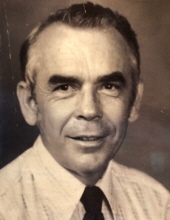 Jay Lester Mitchell, 89, of Marianna, passed away at his home on January 26, 2019. Survivors include his wife of 67 years, Betty, daughter, Melanie, son, Stan (Nyhokia), and, grandsons, Jake, and, Hunter, all of Marianna. He is also survived by sisters: Opal Milsark (Neil), of Panama City, FL, Catherine Kelly, of Elba, AL, Anne Morrow, of Atmore, AL, and, several nieces, nephews, and, cousins. He is pre-deceased by sisters Eula Lee Mitchell Grimes, of Panama City, FL, Odessa Mitchell Guthrie, of Albany GA, and, Winnie Bradley Powell, of Mobile, AL. Jay was an active member of the First Baptist Church of Marianna, and, the Fisherman’s Sunday School Class. He loved God, his family, and, his friends. He thoroughly enjoyed playing golf, deer hunting, fishing, working on the family land, solving Physics problems, and, spending valuable time with his beloved grandsons, Jake, and, Hunter. Jay proudly served in the United States Air Force, where his aptitude, and, later, his career in Physics, was discovered. The USAF trained him in Meteorology, and, the Physical Sciences, which he enjoyed teaching, and, learning about, through his adult life. He also served in the United States Army Reserve. Upon graduation from college, Jay, and, Betty, made their first home in Bristol, FL, where Jay was the principal at Liberty County High School. The Mitchells both loved living in Bristol, and, always have fond memories to share from the time they spent there. Chipola Junior College (CJC) is probably what comes to mind when people remember Jay Mitchell. Jay taught Physics, Physical, and, Earth Sciences, there, for 28 years. He also coached the CJC Golf Team for 17 years, including the National Junior College Championship Team, which produced CJC’s first national athletic win. The golf teams from Chipola were well-known for winning seasons, and, producing exceptional golfers through the years. During Jay’s career at Chipola he received National Science Foundation Fellowships, and, a Shell Oil Fellowship, to study Physics, and, Nuclear Physics, at several large research universities around the country. These universities include: University of California, Berkeley, University of Notre Dame, Yale University, Cornell University, University of Alabama, Texas A & M University, University of Michigan, and, the University of Oklahoma. These learning experiences proved invaluable for the entire family. Jay was retired from Chipola Junior College. The family extends heartfelt thanks, at this time, to Covenant Hospice for their kindness, superior professionalism, and, exceptional care received by the entire family. Due to illness in the family funeral services have been rescheduled. The Mitchell family will receive friends at the Marianna First Baptist Church Sanctuary, Thursday, January 31, 2019 beginning at 10:00am, a service will follow at 11:00am, with Rev. Jeff Powell officiating. A private, family interment will be at Pinecrest Memorial Gardens, Marianna, Fl with James & Sikes Funeral Home Maddox Chapel directing. To plant a tree in memory of Jay Lester Mitchell, please visit our Tribute Store. "Email Address" would like to share the life celebration of Jay Lester Mitchell. Click on the "link" to go to share a favorite memory or leave a condolence message for the family.